South Korea will try to wrap up their 2018 campaign on an unbeaten streak when they take on Uzbekistan in a friendly football match this week. South Korea will face Uzbekistan at the Queensland Sport and Athletics Centre in Nathan, about 10 kilometers south of Brisbane, on Tuesday. The match will kick off at 8 p.m. local time, or 7 p.m. Korean time. The friendly against Uzbekistan will be South Korea's sixth match under head coach Paulo Bento, who took the helm in August. South Korea have yet to suffer a defeat under Bento, collecting two wins and three draws so far with the Portuguese. The match against Uzbekistan will be also South Korea's last match in 2018. The Korea Football Association has yet to confirm any match for December. In 2018, South Korea have so far amassed six wins, five draws and six losses. 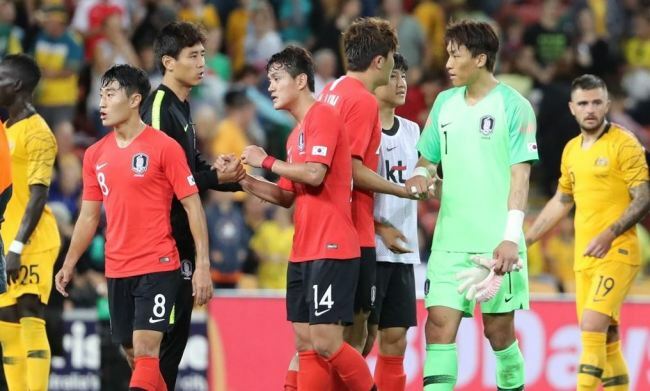 South Korea, 53rd in the latest FIFA rankings, boasts a dominant record against No. 94 Uzbekistan. The Taeguk Warriors have 10 wins, four draws and one loss against Uzbekistan and their only defeat was in 1994. Bento's side is coming off a 1-1 draw against Australia. South Korea were only seconds away from their first away win, but surrendered an equalizer in the final second. Meanwhile, Uzbekistan played to a 0-0 draw with Lebanon in Gold Coast, Australia, on Thursday. For both South Korea and Uzbekistan, the friendly match will be a tune-up for the 2019 Asian Football Confederation Asian Cup, which will be held in the United Arab Emirates in January. Bento didn't call up core players like Son Heung-min and Ki Sung-yueng for the November friendlies. Instead, he decided to test new faces and those who didn't get much playing time in previous friendly matches. Bento tested 17 players, including six substitutes, against Australia. Goalkeepers Jo Hyeon-woo and Kim Jin-hyeon, center backs Kwon Kyung-won and Park Ji-soo, and full backs Park Joo-ho and Lee You-hyeon were not used in the last friendly and may play against Uzbekistan. Bento could give more playing time to those who played less than 30 minutes in the Australia friendly. FC Liefering midfielder Kim Jung-min, who made his international debut against Australia, only played four minutes, while Kashima Antlers center back Jung Seung-hyun played 10 minutes. Gwangju FC forward Na Sang-ho, who won the K League 2 scoring title with 16 goals, and Pohang Steelers midfielder Lee Jin-hyun, played 26 minutes and 14 minutes, respectively, against Australia. FC Augsburg midfielder Koo Ja-cheol was dropped from the squad because of a hamstring injury that he sustained during the Australia friendly. His position is likely to be filled by Ju Se-jong, who is expected to partner with Hwang In-beom in the center midfield like they did against Australia. Some of the South Korean players who recently played for the under-23 side may feel familiar facing Uzbekistan as they met the Central Asian team at the 18th Asian Games in Indonesia. South Korea then beat Uzbekistan 4-3 in extra time in the quarterfinals, thanks to a hat-trick by Hwang Ui-jo. Players like Hwang In-beom, Kim Min-jae, Lee Jin-hyun, Na Sang-ho and Kim Jung-min also featured in that match.